This championship club/course is just west of Estepona. The other golf courses close by are not particularly up-market, but the premium courses around Valderrama are only about 5 kilometers away. Finca Cortesin is a large resort establishment, with hotel and beach club. The golf clubhouse is large and split over two levels, with a good driving range immediately in front of the clubhouse terrace. I have never had any food there, but the coffee was excellent although expensive. Finca Cortesin has recently hosted major professional golf events and the club is clearly working hard to establish itself in the top tier of European golf resort destinations. Service around the clubhouse was very efficient and attentive. 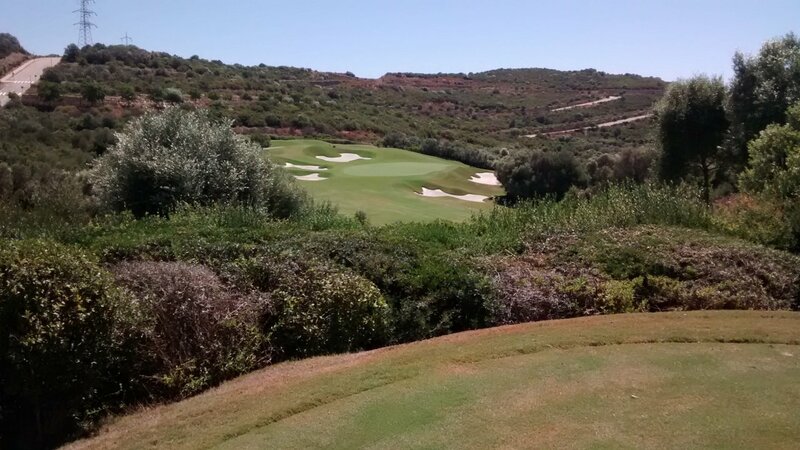 Finca Cortesin is not particularly long, but genuinely difficult. It is set in a big valley, with holes tracking along the side of the valley. This gives most holes significant slope (across the fairway), so it is important to get the line of shots along the fairway correct to allow for the ball to roll back down towards the middle of the fairway. No one hole has big elevation (up/down the fairway towards the green), but the whole course tracks down into the valley then back up to the clubhouse, so there are plenty of holes with some elevation. There are only a few genuine dog-legs, but very few of the long holes are absolutely straight. So you zig-zag up to the green. For example a par 5 will force you to aim right off the tee, then your second is left half of the fairway, then if lucky you are in range for a straight approach shot to go for the green in regulation. There are no hole maps out on the course, but the buggies have on-board GPS-based visual display units. These are incredibly useful for a course of this complexity. This is not a course suitable for walking – take a buggy if only for the on-board digital hole mapping. Fairways are medium width and the fairway grass is high quality. The club has retained a lot of wild natural vegetation for the true rough, so if you end up missing a fairway badly then you are lucky to find your ball let alone get a playable recovery shot. The first cut rough (5-10 meters off the fairway) is soft, fluffy grass that your ball can sit down in. Very difficult to get a controlled shot out of that grass because it grabs your club head. So instead of an easy slow swing, I think you have to play a strong strike down behind the ball just to get any kind of elevation on the ball – otherwise you can duff the ball a few meters. There are a lot of bunkers (many pot-holed) on this course – between 5 and 10 on every long hole. Bunker sand is fluffy but not fine-grained – so requires a strong shot to lift the ball. The greens are medium sized, and complex shaped (not consistently round). They are tightly mowed and generally fast. In particular, downhill putts are lightning fast and uphill putts are much slower. I realise this is not intuitive – ignoring the nap of the green, putts should play consistent speed both uphill and downhill. But that was what I encountered many times at Finca Cortesin, so I have to report it like it is. Surrounding the greens are dips and hollows and green-side bunkers. The edges of most greens slope away so your ball can easily trickle off the green to give you a difficult shot back on to the green. Often you may think you have a good approach shot to the green then watch in disbelief as your ball slides off the green and you have effectively dropped a shot. So greens are difficult to hit and difficult to get down in 2 putts. I have great respect for Finca Cortesin. I think the design is very subtle, very smart, very modern. Not a course for high-handicap (25+) players – just too tough. No one feature is particularly difficult, but the combination of difficult factors on every hole adds up to make this course a real challenge despite not being particularly long. I think low-handicap golfers need 3 rounds here before they start playing it well, and all other golfers require 5 rounds before they start playing anywhere near their handicap. That is what is required to appreciate the subtleties on each hole. So if you only plan to play this course once, you can still enjoy the experience but will think your score a bit random. Finca Cortesin seems to be quite a windy course. Perhaps it is just the shape of the valley that funnels wind up/down the valley. 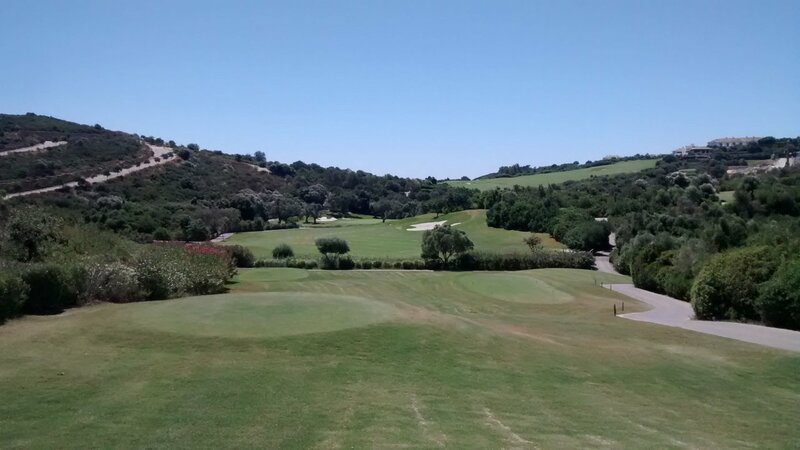 Finca Cortesin is expensive to play. I think it worth the money, although I personally would only tend to play it if I got some discount at a special event. I like this course a lot. 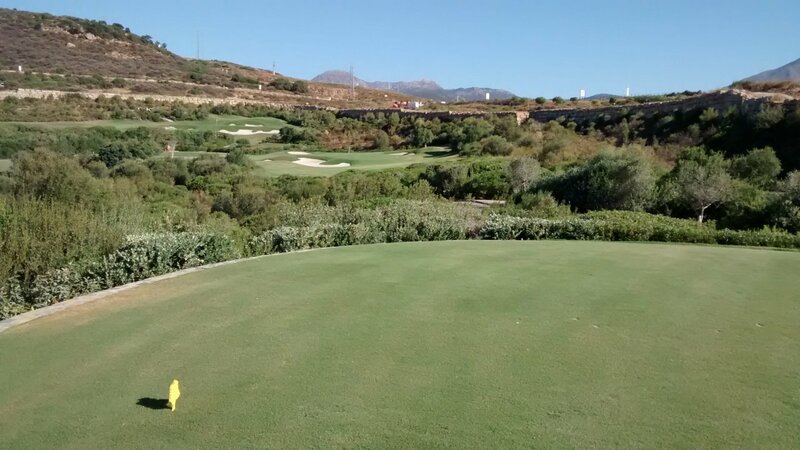 Certainly 'top 3' on the entire Costa del Sol for a sophisticated golfing challenge. I particularly like the feeling I get here that I am not being patronised (looked down on) by anyone. This place has a good mix of quality and service – it simply feels really well-managed. Review last updated: July 2015. Number of times played: 2. Finca Cortesin is the yellow dot. This shows the course is 'top 10' in terms of difficulty compared to other courses on the Costa del Sol. It is slightly longer than the average for courses down here. An 18-handicap player could expect to go around this course in 21 over par.